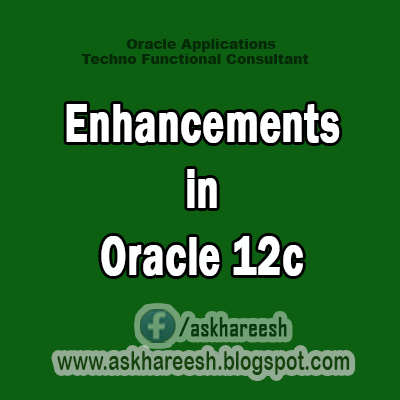 In Oracle 11g R1, Oracle introduced a couple of good enhancements in the form of invisible indexes and virtual columns. Taking the legacy forward, invisible column concepts has been introduced in Oracle 12c R1. A Column defined as invisible, will not appear in generic queries (select * from). An Invisible Column needs to be explicitly referred to in the SQL statement or condition. Also invisible column must be explicitly referred in INSERT statement to insert the data into invisible columns. The above setting is only valid for DESCRIBE command. It has not effect on the SELECT statement results on the invisible columns. Now one would be wondering where one could use the feature of invisible. Well it could be handy when you are adding a column to your table, but you don’t want any existing code to be impacted by it. Another case where it could be useful is when using audit columns. Columns as the creation_dt, update_dt, user_creation and user_update will only be of any added value when you would like to audit a certain column. Packages with inserts, updates, references to this table will not be impacted by the creation of this column. On the other hand there is also a risk that you forget that this column is in there, because you have to explicitly call for it (a describe or select * will not show this column). Most importantly it could be handy, but don’t forget this column or it will pollute your table. This enhancement gets rid of the prerequisite to truncate all child records before truncating a master table. The new CASCADE clause can also be applied on table partitions and sub-partitions etc. A new SESSION level database sequence can be created now in 12c to support the session level sequence values. These types of sequences are most useful and suitable on global temporary tables that have session level existence. Session level sequences produce a unique range of values that are limited within the session, not across the sessions. Once the session ends, the state of the session sequences also goes away. The CACHE, NOCACHE, ORDER or NOORDER clauses are ignored for SESSION level sequences.